Lucy's Lightsaber/hydrospanner (Simple Mechanics tool): Inbuilt Weapon, Supreme Craftsmanship. Upgrade skill. Lucy's Calibrator (Precision Mechanics Tool): Remove [ss] dice from checks. Safety features: add [a] to results. Supreme craftsmanship: Upgrade skill. Lucy's High Speed Data Adapter (Precision Computers Tool): Remove [ss] dice from checks. Safety features: add [a] to results. Supreme Craftsmanship: Upgrade skill. Lucy's Stealth Cargo Container (Precision Stealth Tool): Remove [ss] dice from checks. Safety features: add [a] to results. Supreme Craftsmanship: Upgrade skill. Grit 1 Gain +1 strain threshold per rank of Grit. Solid Repairs 1 Lucy repairs +1 hull trauma per rank of Solid Repairs whenever she repairs a starship or vehicle. Parry 1 When hit by a Brawl, Melee, or Lightsaber attack, Lucy can suffer 3 strain to reduce damage by 2 plus ranks in Parry. Soresu Technique When making a Lightsaber skill check, Lucy can use Intellect instead of Brawn. Lucy's attunement to the Force allows her to understand how it interacts with machines and computers. All things, even the inorganic, are part of the Cosmic Force. Control: Damaged Item Commit [f] One damaged weapon or item counts as being undamaged. Control: Mechanics When making a mechanics skill check, Lucy may roll a Manipulate power check as part of the pool and may spend 1F to gain [S] or [A] (user's choice) on the check. Attune to the Living Force, sensing life and even the thoughts of those around her. Control: Sense Thoughts Lucy may spend 1F to sense the current thoughts of one living target with whom she is engaged. Basic Power Lucy may spend 1F to sense all living things within short range, including sentient and non-sentient beings. Lucy may spend 1F to sense the emotional state of one living target with whom she is engaged. Influence the emotions and thoughts of the people around her. Basic Power Lucy may spend 1F to stress the mind of a living target she is engaged with, inflicting 1 strain. Lucy can use her understanding of the Force to apply supernatural force to her athletic feats. Control: Resilience When making a Resilience check, Lucy may roll an Enhance power check as part of the pool. She may spend 1F to gain [SU] or [AD] (her choice) to the check. Basic Power When making an Athletics check, Lucy may roll an Enhance power check as part of the pool. She may spend 1F to gain [SU] or [AD] (her choice) to the check. Lucy can move objects via the power of the Force. Basic Power Lucy may spend 1F to move one object of silhouette 0 that is within short range up to her maximum range. The default maximum range is short range. Range 1 Spend 1F to increase the power's range by a number of range bands equal to Range upgrades purchased. Control: Hurl Lucy can hurl objects to damage targets by making a ranged combat check combined with a Move power check, dealing damage equal to 10 times silhouette. Control: Pull Lucy can pull objects out of secure mountings or out of an opponent's grasp. 1) Lucy discovered her force sensitivity through trial and error. She has always been "in tune" with the machines the people of the Program tasked her to work on, and how they fit in with the world around them. Over time, she learned that she could also be "in tune" with the people around her. 2) While part of the Program, Lucy was tasked with several designs of weapons. She learned that her designs had been used for mass destruction. The despair and conflict she felt led her to become highly guarded in all of her interactions. 3) Thanks to her ability to sense those around her, Lucy discovered that she was scheduled for some form of reconditioning. Over time, she weakened the facility's security and pushed enough of the guards around her to allow her to reach the shuttle bay. Once she was free, it was several harrowing near-failures which led her to reach Republic space and find a contact within the New Jedi Order. 4) A boy she worked with at the facility, Dario, was another student like her. She tried to get him to escape with her, but he chose to stay behind. It's entirely likely that he, like her, is force-sensitive, and may end up as a rival or even an Inquisitor later on. 5) When Lucy discovered the use of her design as a weapon of mass destruction, she launched a covert campaign to aid the victims and undo her mistake as much as possible. She attempted to destroy the plans and prototypes, though whether she was successful or not remains unclear. Lucy's overwhelming motivation is the guilt over the use of her weapons to destroy the lives of innocents. This is something that she is going to need to learn to let go in order to move forward, but it does also provide her with the drive to help the innocent wherever she can. Her high intellect leads her to be intensely self-critical, even if she acts outwardly aloof and detached. Until recently, she's been on the run from the Imperium Reborn. She's had to strain her morality in a few instances, but her primary motivation holds her back from choices which would be difficult to redeem. Ultimately, despite her upbringing in an Imperium Reborn facility, Lucy's natural pull towards the Light gives her a profound sense of mercy. While she won't hesitate to fight for what she believes to be right, she will show compassion and mercy for the defenseless and even give aid to a fallen enemy, within reason. The abuse of Lucy's talents for weapons of mass destruction have left her with a profound sense of betrayal. It is difficult, though not impossible, to earn her trust. This tends to manifest as a somewhat caustic attitude and competing goals of pushing people away, but desiring to have friendships and connections, something she didn't have while part of the Program. Lucy is the product of an Imperium Reborn top secret weapons design program. When she learned the weapons she developed were used as weapons of mass destruction, she used her nascent Force abilities to engineer her escape. Starting XP: 110xp Human, +10xp NJO character creation XP bonus, +20xp NJO earned XP bonus. Mission: Bungle In The Jungle - 2018-06-24 - +25xp, +2 Harmony, -2 Conflict. +300cr. Minor Breakthrough: Directly confronted with a reminder of her past, Lucy spent time training with Mia Harkness, a fellow Imperial. Something, maybe her chance to face Mia directly, allowed her to come a bit out of her shell, and she connected with the Knight on some level. Crafting: Lightspanner (or Hydrosaber, hasn't decided yet): Simple Tool (Mechanics), Inbuilt Weapon (Lightsaber Hilt), Supreme Craftsmanship. 3 days, 110cr. 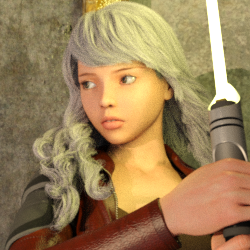 Vignette: Overcoming The Past - Lucy spent more time training with Jedi Knight Mia Harkness. Getting pushed to her limit opened up the possibility for her to understand that when the Force is your ally, self-imposed limits can be surpassed. Gained the Enhance Force power. Minor Breakthrough: Yet another reminder of her past, the droid brain implant found on one of the suspects in the bombing seemed eerily similar to a project which was developed in the top secret weapons development project she was a part of in the Imperium. Crafting: Precision Calibrator: Precision Tool (Mechanics), Safety Features, Supreme Craftsmanship. 3 days, 430cr. Crafting: High Speed Data Adapter: Precision Tool (Computers), Safety Features, Supreme Craftsmanship. 3 days, 430cr. Mission: Hide and Seek - 2018-07-01 - +25xp, +3 Harmony, -0 Conflict, +300cr. Minor Breakthrough: Lucy often had to use her wits and make some shady choices when she fled the Imperium. Today's investigation led Lucy to realize that she could harness those talents for the good. Crafting: Stealth Enhancement Generator: Precision Tool (Stealth), Safety Features, Supreme Craftsmanship. 3 days, 430cr. Minor Breakthrough: Lucy was able to push through her difficulties in training to make a breakthrough with her abilities in combat beyond simply support. Crafting: Lucy's Mark 1 Armor: Light Armor, Special Embellishment (Stealth), Extra Soak, Integrated Attachment (Superior), Special Effect (Add 2 boost to Stealth check once, but damages armor), Fragile. 3 days, 625cr.